A study led by Monash University biologists using the invasive plant ‘annual ragweed’ has found that adaptation to new environments can occur rapidly and consistently. The study led by Monash University biologists Lotte van Boheemen and Dr Kathryn Hodgins is published in the New Phytologist, and could have implications for people suffering from hay fever as the results indicate that climate change is likely to select for larger plants with greater pollen production. “Evolutionary biologists have long pondered the question of how quickly species can adapt when faced with new environmental conditions, and changing climates, and whether or not such change follows a predictable route,” said Dr Hodgins, who heads the Plant Ecological Genomics Group in the School of Biological Sciences at Monash. “This question is not just one driven by curiosity. Dr Hodgins and PhD candidate Lotte van Boheemen investigated how a common weed, known as ragweed, has been able to invade a wide range of climatic regions across the globe. They uncovered an unprecedented high capacity of the plant to mount rapid and adaptive genetic changes to their DNA sequence that enables them to tolerate and cope with new environments the weed encounters. “These genetic changes in ragweed were consistent with traits evolving in parallel across multiple areas of the globe in response to the local environment,” said study senior author Dr Hodgins. This news is good and bad. Good, because it suggests that other species, those that are not weeds, but treasured for their beauty or role they play in our ecosystems, might be able to do the same, hence averting catastrophic species losses in the face of ongoing climate change. Bad, because the common ragweed is noxious – spreading out of control, and a major cause of hay fever worldwide, costing millions of dollars each year. “The capacity to rapidly adapt might be a key ingredient for invasive success in many species, especially those, like ragweed, which have a short generation time and high levels of genetic variation within populations,” Dr Hodgins said. 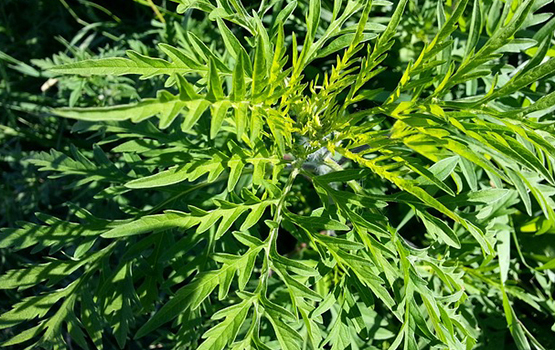 The rapid adaptation observed in this species could facilitate the further spread of this weed during ongoing climate change due to the expanding favourable range for common ragweed. “Given our results, climate change is likely to select for larger plants with greater pollen production, which is going to be problematic for people suffering from hay fever,” said lead author Lotte van Boheemen. The results of this study reveal that evolution can be rapid and repeatable a finding that is nothing to be sneezed at in an era of massive environmental change.